The Writeous Babe Project: Am I Crazy For Blogging Like Crazy? Am I Crazy For Blogging Like Crazy? Today is day 11 of #bloglikecrazy, my challenge to write 30 blog posts in 30 days. Last night I sat in front of my computer for two and a half hours trying to think of something to blog about for today. I didn't feel inspired by any of the prompts I've been providing for folks joining me in #bloglikecrazy, and the words just wouldn't come for the post I'd hoped to write. Suddenly, I became very discouraged and began to doubt myself. What's the point? I wondered. Why am I bothering to "blog like crazy" in the first place. It's not like I have thousands upon thousands of people eagerly awaiting to read my words. Why do I even bother to blog in the first place when there are so many other blogs out there about writing by people who have been more successful than I and so many blogs out there about feminism by people with more education in women's history and gender studies. Then suddenly, as if the Creator heard my whining and decided to do something to pull me out of my self-pity, I stumbled upon a blog entry on The YeYo Diaries titled What's the Point of Blogging? In the post the blog's author Amber lists reasons why she has continued to blog for five years despite the fact that the blogosphere is so crowded these days. Even before reading Amber's list my own reason began to flood my mind, reminding me that I have never blogged for millions of page views, for money or to win blogging awards (although those things would be nice). I blog for the practice, the people, and the personal growth. The Practice. I've mentioned on this blog before the importance of treating writing as a practice, as something we must work at daily like the football player preparing for the big game or the runner training for a marathon. Blogging is the perfect way to practice my writing. Blogging also helps me work on making my writing more captivating and concise, which helps me write stronger articles for the publications for which I freelance. The People. Ironically, for me the best thing about blogging has little to do with the process of writing. What I enjoy most about blogging is all the connections I've made with other women who blog. This month's #bloglikecrazy challenge has been the perfect example of how blogging can bring people together. Many of the women in my writing group See Jane Write are participating in #bloglikecrazy and over the past several days they have been sharing their blog posts on the See Jane Write Facebook group page. These posts have sparked meaningful conversations about topics ranging from fitness to family to mental health. And in most cases these conversations have been between women who didn't know one another before meeting via See Jane Write and #bloglikecrazy. These women have discovered common interests and decided to build relationships offline. In a few weeks we'll be gathering at a local park for a short run and a picnic of healthy snacks, an event that evolved from a conversation that began because of a blog post. The Personal Growth. 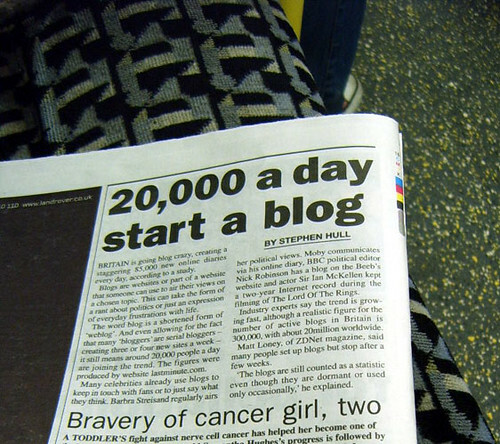 I've never viewed any of my blogs as online diaries. The first blog I wrote was one I maintained for the alternative weekly I worked for in Louisville, Ky. Then I started Georgia Mae with the idea that it would evolve into an online women's magazine. And The Writeous Babe Project was originally meant to be a blog for writers. Yet, with all these sites I inevitably did write about my personal life. Often the best way to discuss current events, feminist issues, and matters important to writers is by sharing my own experiences. Thus, my blog has been a way for me to work through personal issues in a productive and creative way. And just clicking though the archives is a great way to see how much I've grown and changed over the years. Loved this! Thank you for the shout out! "I do it for the joy it brings"